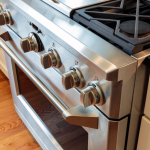 There are several advantages of using gas ranges instead of electrical stoves. One is open flame tends to be more responsive than that of using an electric burner. You can easily adjust the temperature of your cooking with the former. Another is it can use all types of cookware. Unlike the electric one that requires induction-compatible cookware. One of the known brands in kitchen ranges is Thor Kitchen. The company claims that their gas ranges would bring back the fun in cooking. They assert that their professional ranges are created with stainless steel material. Thor Kitchen also notes that their ranges have high-powered BTU burners for cooking satisfaction. Here, we have listed their kitchen ranges’ pros and cons, as well as seven of their products. When making the decision if a kitchen range is suitable for you, one must consider several factors. Some of the important factors include: size of family, lifestyle, price, size, and reliability. Customers claim it cooks well and simmers okay. 5.2 cubic foot oven has an infrared broiler and powerful convention. This Thor Kitchen HRG3080U 30″ Freestanding Gas Range is one of the company’s stellar products. It is equipped with four sealed burners. On the left corner, lies the most poweful heating element of this unit. That sealed single burner is said to have the capability to generate up to 18,000 BTU of heating power. The ergonomically design range-top cooktop claims to standout with its competitors due to its sealed configuration. In cooking, sealed or closed burners are considered to be more efficient than open ones. Beisdes that, they are also easy to clean. Besides the cooktop, this unit also boasts of an oven with a capacity of 4.2 cu.ft. Said oven is equipped with two burners: the U-shape Stove burner and the broiler burner. 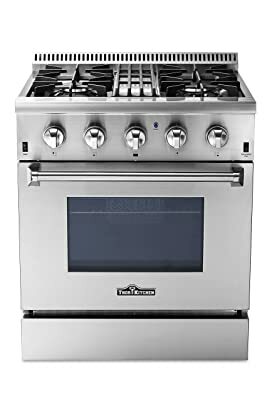 For me, the outstanding quality of the Thor Kitchen HRG3080U 30″ gas range is its weight and build. This one weighs at approximately 80 kg, which is considered light as far as burners go. Furthermore, it is a freestanding unit, which means it complies to any modern kitchen design or space. If you’re in a big family, you might like to consider this Thor Kitchen HRG4804U 6 Burner Gas Range with Double Oven. 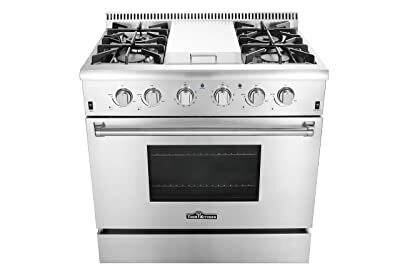 This 48” freestanding gas range claims to do all your cooking needs. It has a 6-burner cooktop with different power BTUs. It also features two ovens. For simultaneous cooking, this might be a good option. Three of its key features include: the oven’s blue porcelain interior, the halogen lighting, and the convection fan. The convection fan is said to circulate the heat. Thus, it could help to distribute heat evenly. The halogen lighting makes the cooking process easily monitor-able. The blue porcelain interior could add a bit of elegance into the kitchen. 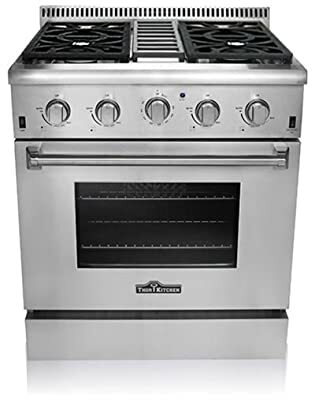 Thor Kitchen claims that with this 36″ Freestanding Professional Style Gas Range, one can cook like a professional chef. It is equipped with a 5.2 Cu. Ft. oven, which can have all the space needed for any baking needs. Besides that, the freestanding gas range has 6 burners. Those high-powered burns assert than one could cook from a high heat. This is especially useful if your dishes mostly include frying and boiling processes, as well as low simmers for delicate sauces. Despite it advertised as a freestanding unit, it also has a removable back-splash. This feature gives the unit versatility so it can be used as a freestanding one or a slide-in range. In a nutshell, the Thor Kitchen HRD3088U 30″ Dual Range has four burners, convection fan, and 4.2 cu. ft. oven. The four burners compose of two 12,000 BTU single burners, one 15,000 BTU dual burner, and one 18,000 BTU single burner. Besides that, this dual-fuel range includes a 3,500-watt broiler. Same as the other units, this one has sealed burners. Heavy-duty cast iron grates compliment those. Additionally, the oven features two stainless steel, sliding baking racks. 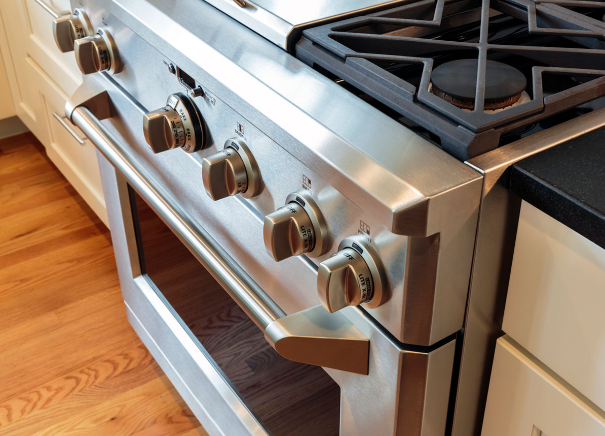 The Thor Kitchen HRG3026U 30″ Gas Range claims to offer several features to note. It has electronic ignition with auto re-ignition option. The modern stainless steel surface looks great and is easy to clean. To accommodate multiple baking needs, there are two oven racks that can be configured. I appreciate that the oven is said to accommodate a standard full-size sheet tray. Burner is with 15,000 BTU, as well as a 650 BTU simmer function. The 18,000 BTU burner is said to be utilized for high heat searing. This might be my favorite feature. There are also twin 12,000 BTU burners. They are used for medium to high heat cooking. Another gas range unit of Thor Kitchen is the HRG3617U 36″ Gas Range. This gas range offers four sealed burners. The two front single burners have 18,000 BTU. The other two back dual burners have 15,000 BTU. If the burner flame extinguishes, there is an automatic re-ignition feature, too. My favorite part for the countertop would be the black porcelain drip pan. This one facilitates in cleaning surfaces. We all know it’s a chore to tidy those parts! As for the 5.2 cu. ft. oven, it features an infrared broi burner with 16,500 BTU. This claims to sear one’s food while sealing the juices. Last but not the least in this list is the Thor Kitchen HRG3031U Professional Style Stainless Steel Gas Range. Similar features with the first ranges mentioned include: commercial convection fan, blue porcelain oven interior, and two halogen lights. 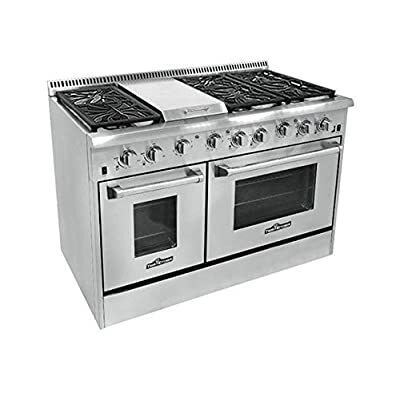 The cooktop features two sealed dual burners with 15,000 BTU and 650 BTU simmer functions. It also has two sealed single burners with 12,000 BTU. Those burners are said to deliver the right heat for whatever dishes you’d like to whip. I like the cast iron flat cooking grates of this range, too. They can host large pots. Those grates also make it easy for one to move them around. Thor Kitchen claims to provide professional but affordable and stylish kitchen products to consumers. Besides the value and quality they assert to give, the company also offers two years parts and labor warranty for all their kitchen range units. 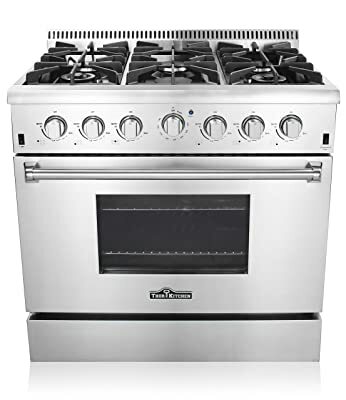 Among the gas ranges that we listed above, the Thor Kitchen HRG3080U 30″ Freestanding Professional Style Gas Range stood out. This unit received tons of good reviews via Amazon due to its style, price, and quality. Most customers mentioned it looking and working beautifully. Besides noting that it looks amazing in one’s kitchen, it is said to function perfectly. 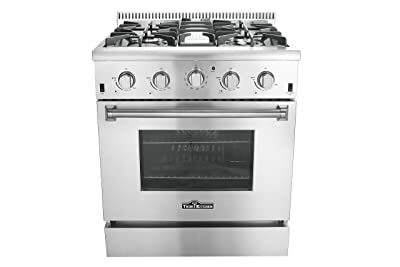 The heavy-duty grates, easy installation and cleaning, and great working condition of the convection fan are some of the positive traits to look out for this gas range.